We have two training rooms, so there is a schedule for each. Training Room 1 consists of all Youth and Adult Uechi-Ryu Karate classes, and Strength & Conditioning; while Training Room 2 has classes for Demian Maia Jiu-Jitsu, Sityodtong Muay Thai, and Mixed Martial Arts. Remember, with a ZenQuest membership you can take an unlimited number of classes. or equivalent in training gear! Our normal tuition rates are as low as $97/ month for adults and $91/ month for children! (based on annual enrollments.) We also have discounts for Families, Groups, Law Enforcement, Corrections Officers, Emergency Responders, and College Students! Kick off your martial arts experience at ZenQuest with four private lessons tailored to your own interest and learning pace! Private training can be scheduled at your convenience, to accommodate those busy people on the go. Give YOUR learning curve a boost and build your skill set up quickly with this option. 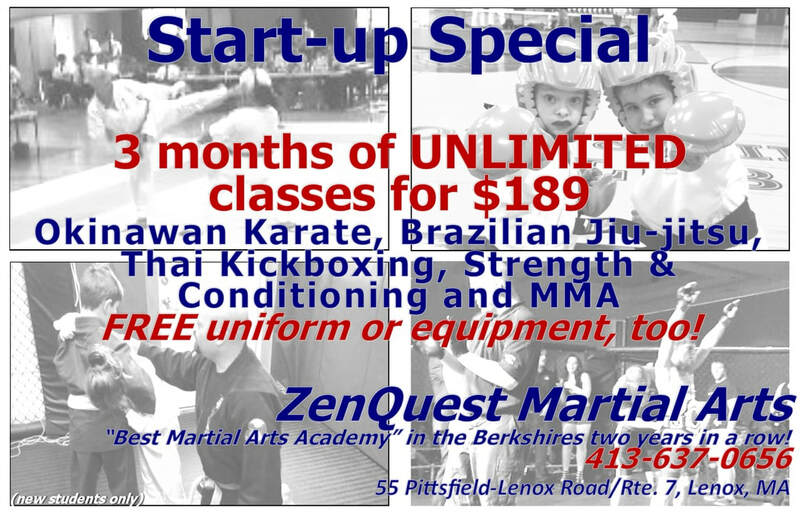 Stop by ZenQuest, email or call us at 413-637-0656 to join! Offers are for new students only. Free uniform is a lightweight Karate style uniform. A credit of $20 may be applied to upgrades for better Karate uniforms, Jiu-jitsu uniforms, OR other equipment (IE. boxing gloves, sparring gear, etc.) as an alternative. Bring your friends and SAVE! It's BACK! For a limited time you can take advantage of our "Referral Rewards" program. Receive a $50 gift certificate for each friend you bring with you. You and your friend will also be entered into a drawing on October 1st for an additional $50 gift certificate! !